Well, it looks as if this blog might go unattended for a few weeks, as my wife and I are celebrating the birth of our first child. It’s difficult to describe the feelings that race through your mind when you stare at your baby for the very first time, but some things are put into perspective. I have an essay in the works that traces the historiography of African American troops in the Civil War, but while I’m working on that I thought I’d post a few books that are required reading for the subject. I figured I’d post 10 general histories that one should consider and then some unit histories and memoirs that stand out as well. Here goes. Keep in mind this is only skimming the surface – but if you’re interested in researching this topic this is a good place to start. Since President’s Day was this past Monday, I thought I’d blog a bit on our 16th President and his relationship with the USCT’s. Abraham Lincoln had the good sense to realize that African American soldiers were “a resource which, if vigorously applied now, will soon close the contest. It works doubly, weakening the enemy and strengthening us.” From the adoption of the Second Confiscation and Militia Acts in 1862 to the Emancipation Proclamation of 1863, Lincoln’s thoughts on the usefulness of black soldiers had evolved. This evolution would continue through the end of the war when he would ruffle feathers by recommending the commissioning of black officers and pushing for full citizenship and voting rights for those who served. But what of the personal relationship between Lincoln and his “black phalanx”? Well, it was a relationship that got off to a rocky start due to one of the aforementioned pieces of legislation – the Militia Act of 1862. Lincoln had never been a big fan of the Second Confiscation Act or Militia Acts because their infringements on personal liberty made him worry that the acts would be dismissed as unconstitutional. Yet he was technically bound to them and the stipulation in the Militia Act that black soldiers only receive $10 a month ($7 pay and $3 clothing allowance). The relationship between Lincoln and his black soldiers is often portrayed as paternalistic and immovable. Yet at times, even this unique bond was proven to be vulnerable to the strains of a country advancing in fits and starts toward a new birth of freedom. The museum will host a film festival during the month of February featuring films with African-American themes. All movies are free with each day's paid admission. All movies start at 1 p.m. Starring Denzel Washington, Morgan Freeman, and Matthew Broderick, this 1989 movie chronicles the all-black 54th Regiment of the Massachusetts Volunteer Infantry. 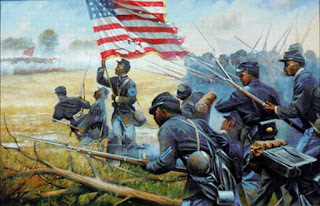 Their final assault on Fort Wagner, S.C. demonstrated their bravery and turned a bitter defeat into a symbolic victory that brought recognition to black soldiers. In 1928 a man by the name of William E. Woodward wrote a God-awful book entitled Meet General Grant. “The American negroes are the only people in the history of the world, so far as I know, that ever became free without any effort of their own…It [the Civil War] was not their business. They had not started the war nor ended it. They twanged banjos around the railroad stations, sang melodious spirituals, and believed that some Yankee would soon come along and give each forty acres of land and a mule” (Woodward, Meet General Grant, p. 237). I just wanted to take a quick minute to give props to the new PBS documentary called For Love of Liberty: The Story of America’s Black Patriots. This 2-hour film gives the entire history of blacks in the military, with a good portion devoted to the American Civil War. 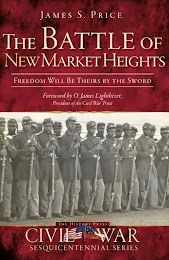 Standard stories such as Robert Smalls’ commandeering of the USS Planter, the 54th Massachusetts’s attack on Battery Wagner, and (my favorite, of course) the story of the fourteen Medal of Honor winners at New Market Heights are competently and compellingly told. More controversial topics like Fort Pillow, Saltville, and other "massacres" are avoided, but the documentary is still very much worth watching. For those of you who happen to live in the Metro Richmond area, I highly encourage you to check out the American Civil War Center’s new traveling exhibit entitled Take Our Stand: The African American Military Experience in the Age of Jim Crow, on display now at the Black History Museum and Cultural Center of Virginia. The exhibit tells the story of African American participation in the military during the fifty year span of 1898 – 1948. From the Spanish American War to the desegregation of the armed forces, Take Our Stand chronicles the exploits and travails of those Buffalo soldiers who fought two wars – one against America’s enemies and one against prejudice. Now, technically the subject of this exhibit falls outside of the purview of this blog, so why, you may ask, would I mention it here? Well, I wrote the first draft of the exhibit script back when I worked at the American Civil War Center! Welcome to The Sable Arm – A Blog Dedicated to the United States Colored Troops of the Civil War Era! 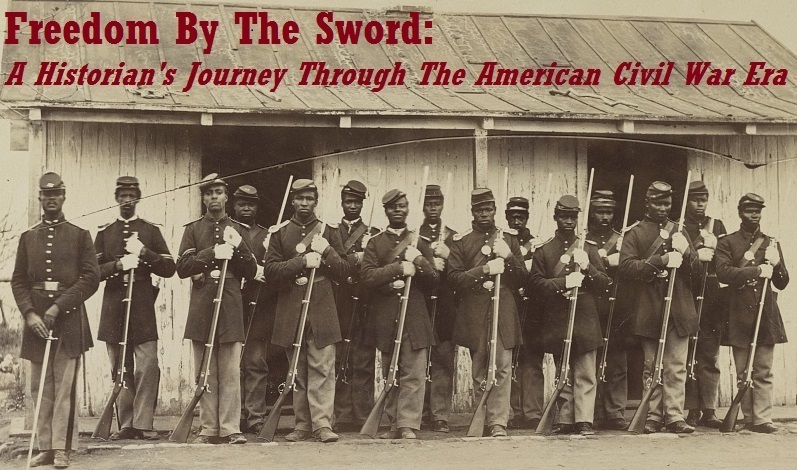 To increase awareness of the role played by USCT’s during the American Civil War. To explore how veterans and contemporaries as well as professional and amateur historians have chronicled the story of the USCT’s. That’s where you come in! Like any good blog out there group discussion, polite debate, and a healthy exchange of ideas will hopefully lead to the accomplishment of the above-mentioned goals. Now, for those of you wondering just who the heck this upstart trying to master the entire history of a subsection of the Union army is…here you go. I am one of those lucky individuals whose passion is also their job. When my family moved to Virginia in the mid-80’s I became fascinated with the American Civil War and I have not looked back since (just ask my wife). I’ve had the good fortune to work at such places as Richmond National Battlefield, Pamplin Historical Park, and the American Civil War Center at Historic Tredegar. After completing my Masters Degree, I became a museum educator for the County of Henrico in 2008. As many of you know, Henrico was the site of the Battle of New Market Heights, where fourteen African American soldiers were awarded the Congressional Medal of Honor. It is my research on this battle that sparked the idea for this blog and the rest, as they say, is history. And speaking of history, let’s get to blogging, eh?